Although I have been living in Bangalore for six years, I haven't explored much of Karnataka except for the nearby Mysore. I feel it's quite strange given the fact that I love to travel. Early this year, I visited Madikeri with a bunch of friends and it was a fresh experience. Last weekend, it was the turn of Mangalore. With a big group of friends interested in this trip, our travel planner took the efforts to book the tickets and a place to stay. A big surprise came to me when I noticed the cranky side middle berths in our train. The railways would be making great profits but it's so very inconvenient for common people. A person of short stature like me found it hard to fit in my head. I wonder how the tall guys or girls would manage. The morning breeze and the scenery reminded me of my numerous Kerala trips. After a quick shower at the hotel, we got dressed and were ready to satiate our hunger pangs over complementary breakfast at the hotel restaurant. The hotel manager would have dropped the idea of free food, looking at the way we all hogged the dosas. We spent the sunny afternoon at the Ullal Beach playing a game of ring. After lunch, we headed out to the encha nting Bekkal Fort. 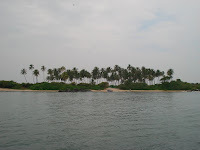 This is the place where Manirathnam shot the Uyire song in Bombay. 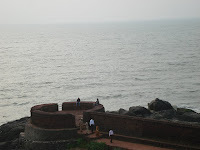 A stroll around this fort with the breeze and the sea for company is a perfect way to spend an evening. The beautiful sunset and the rocking waves were so romantic. The next morning, I was so looking forward to visiting St.Mary's Island. I felt it wasn't worth the hype. But I collected some cute sea-shells, adding to my collection. After a quick visit to Krishna temple at Udipi, we rushed back to catch the train back to Bangalore. When we thought the fun was over, we were wrong because a game of UNO in the train made the trip even more interesting. An interesting weekend got over and it was time to get back to the routine. Karnataka has so many beautiful places to see. Hope I could visit more new places next year as well.